2017 NextGen Chef Peita Fleming. 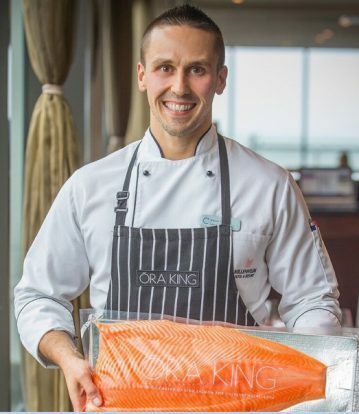 Three of New Zealand’s most promising young chefs are set to work alongside their culinary idols as part of Ōra King Salmon’s Next Generation (Next Gen) mentoring programme. Now in its third year, this mentoring scheme provide three aspiring chefs the rare opportunity to benefit from the skills and experience of some of New Zealand’s most celebrated chefs. 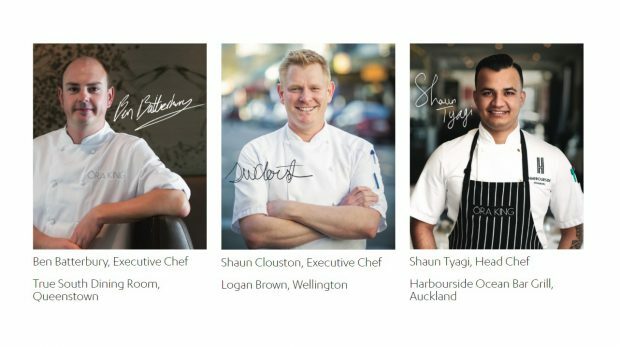 This year, those chosen three chefs will work alongside Shaun Tyagi (Harbourside Ocean Bar Grill, Auckland), Shaun Clouston (Logan Brown, Wellington) and Ben Batterbury (True South Dining Room, Queenstown). After fielding applications from around the country, a panel of Ōra King judges selected this year’s successful candidates after they demonstrated both an obvious culinary talent, as well as the drive to learn and develop their skill sets. Alexis Vienot, 32, a chef de partie at Wellington Copthorne Hotel’s One80 Restaurant, who will be working with Shaun Tyagi. Alex Southwick, 19, a third-year apprentice chef at SKYCITY’s The Sugar Club, who will be paired with Shaun Clouston. Karen (Qinmo) Guo, 26 a commis chef at Harbourside Ocean Bar Grill, who will be working alongside Ben Batterbury. Alexis Vienot, 32, a chef de partie at Wellington Copthorne Hotel’s One80 Restaurant. Hailing from France, Vienot is more experienced than the other Next Gen chefs this year, so his pairing with Shaun Tyagi at Harbourside Ocean Bar Grill is seen as a chance for him to experience a different type of kitchen and help him in his progression towards becoming a head chef. Southwick, meanwhile, may still only be 19, but has already been labelled as one to watch in the industry with his passion for food combinations and styling. Heading to Wellington to work alongside Shaun Clouston at Logan Brown will prove an invaluable opportunity for Southwick to immerse himself in one of the capital’s premier fine dining establishments. Guo was encouraged to apply for the mentoring programme by her head chef – and Next Gen mentor – Shaun Tyagi. Heading to Queenstown for the first time to learn from True South Dining Room’s Ben Batterbury, she is set to gain huge confidence cooking for high end international travellers. Guo says she already knows cooking is her life’s calling and is excited to learn from one of the best in the business. “I can’t wait to work alongside Ben Batterbury and gain inspiration and learn some new techniques. I’m also keen to prove to myself and my head chef who encouraged me to do this that I’m ready to achieve at this early stage of my career,” she says. Batterbury says he’s also looking forward to taking part in the programme and passing on some of the knowledge he’s acquired over his own career. “The Ōra King Next Generation mentoring programme is an incredibly rewarding opportunity for everyone involved,” he says. The young chefs each take part in a one-week placement at their mentor’s restaurant between 3 April – 13 May before demonstrating their newly refined skills at an exclusive industry event in Wellington on 5 June. New Zealand King Salmon marketing general manager Jemma McCowan says Ōra King remains committed to nurturing the young talent the country’s food service industry produces. “This is the third year we’ve held this unique industry initiative and we continue to be thrilled with the calibre of the young chefs benefitting from the programme,” she says.